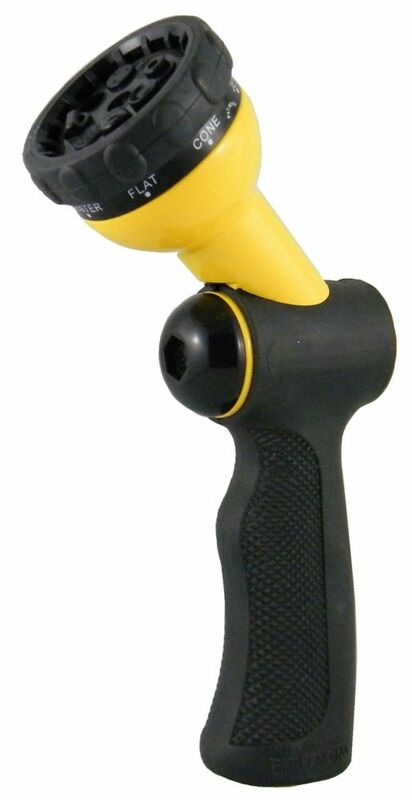 8 Pattern push button nozzle with coated non slip handle. Heavy duty construction. Crush-proof construction built for the pros, with a heavy-duty, all-zinc body that stands up to tough worksites and frequent use. Powerful materials resist up to 5,000 pounds of pressure, preventing damage to coupling and body. Designed to handle the high-pressure water flow of professional worksites. 8-Pattern Push Button Nozzle 8 Pattern push button nozzle with coated non slip handle. Heavy duty construction.